THAT'S THE SPIRIT: Making a few runs during the four-overs seven-a-side exhibition match. Those who are well versed in the Usain Bolt origin story are keenly aware that track-and-field was not the first sport he excelled at. The gentleman's game of cricket, as his autobiography 9.58 My Story attests, was the childhood favourite he nurtured all throughout primary and even high school — displaying admirable bat-and-ball skills on the pitch. Then came the eventual and professional switch-over to athletics. As one can imagine, The World's Fastest Man and triple world-record-holder had a ball this past Tuesday rekindling his lifelong passion for the popular Commonwealth sport in Bangalore, India, co-headlining a seven-a-side exhibition match (Jamaica's Team Bolt versus India's Team Yuvraj) at the Chinnaswamy Stadium, which drew a nearly 7,000-strong crowd. The people came out in their numbers to see the internationally famous sportsman put on a show and, if the numerous online accounts are to be believed, the occasion was no letdown. 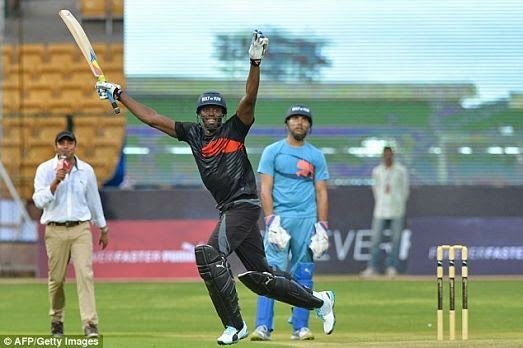 As the temperatures soared, Bolt reportedly had the spectators in his thrall, as he racked up a respectable 45 runs off just 19 balls (including a trio off nemesis Yuvraj Singh! ), leading his team to a thrilling last-ball victory in the four-overs match. You can tell the pace and intensity of the matchup was no tropical breeze, as Bolt even took a tumble mid-way the sizzling encounter, which formed part of a PUMA promotional run in Asia. Both Bolt (fresh from visits to Warsaw and Rio de Janeiro) and Singh (widely considered the hero of the 2011 World Cup) are both PUMA brand ambassadors. As is customary for the 28-year-old sprint superstar, Bolt also made a point of connecting with the local culture, trying on a few Oriental costumes for size (he even tweeted a few pics) and surveying the panoramic Indian landscape from his hotel balcony. Prior to landing in India, the Jamaican sprinter and his executive manager Nugent Walker spent a few days vibing in London before jetting over to Beijing, China, where the 'Director of Excitement' played a part in the dramatic unveiling of the latest model in the ritzy Nissan GT-R series.